2016 PREX panelist Ryan Blackhart, Discovery Counsel at Google, discussed collection strategies: collecting to preserve versus preserving in place and shared thoughts as to when to deploy which strategy for meeting the duty to preserve. 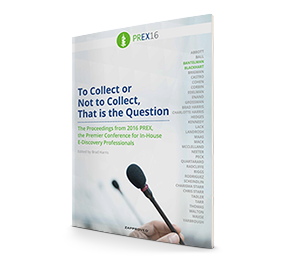 In the past, collecting data to preserve it was the norm for most organizations. It was considered the “Better safe than sorry” approach because as a matter of practice organizations were collecting everything. Of course, the unintended consequence of this approach is that an organization over collects data which increases cost and risk. Recently, preserving in place—maintaining electronic documents in their original location without collecting them—has become a popular choice for complying with discovery obligations. While this strategy can save costs, it is not without its detractors and is not appropriate for every situation. Organizations must ensure that responsive data will not suffer spoliation.